President Rivlin accepts diplomatic credentials from new ambassadors. President Reuven Rivlin on Thursday received diplomatic credentials from the new Ambassadors of Croatia, Jordan, the Czech Republic, Egypt and Mongolia to the State of Israel at a ceremony at the President’s Residence in Jerusalem. As each ambassador arrived, their country’s flag was raised and the Israel Police Band played their national anthem. The ambassadors inspected an IDF guard of honor and presented their credentials to the president. After an audience with the president, the new ambassadors signed the guest book and Hatikvah, the Israeli national anthem, was played at the end of the ceremony. 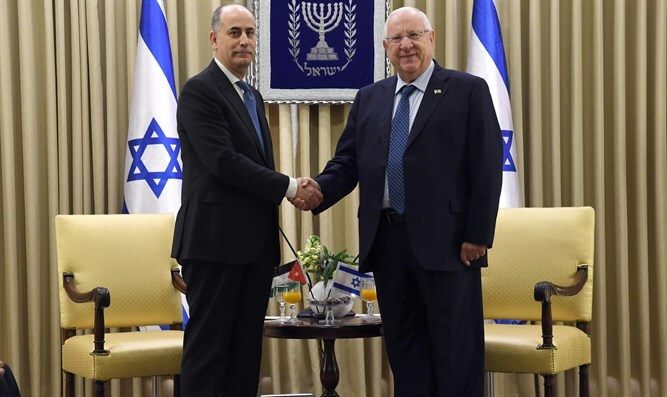 When the incoming ambassador of Jordan, Ghassan Majali, presented his credentials, President Rivlin welcomed him and noted that next year will mark the 25th anniversary of the Israeli-Jordanian peace treaty. “We are determined to live in peace with our neighbors, and we are hopeful and optimistic that others will do as you have done. The good relations between our two countries are a legacy of the leadership of the late King Hussein. Please send my warmest wishes to His Majesty King Abdullah II,” said Rivlin. The Jordanian ambassador presented his credentials and he, too, noted the important anniversary of the peace treaty that will be celebrated next year. The incoming Egyptian ambassador, Khaled Azmi, also presented his credentials to Rivlin. The president began by noting that in a few months time we will mark the 40th anniversary of the Egyptian-Israeli peace treaty. He said he hoped that a way could be found to celebrate the event and to pass on the values of peace and partnership to the next generations. “Since the peace treaty was signed nearly 40 years ago, we have welcomed six Egyptian ambassadors. Now you are the seventh. I wish you success during your time here,” Rivlin said. Jordan and Egypt remain the only two Arab countries to have signed peace treaties with Israel. King Abdullah II of Jordan announced recently that he had decided not to extend the part of the treaty with Israel in which Jordan leased lands in Naharayim and Tzofar to Israel. Prime Minister Binyamin Netanyahu later said that while he acknowledges Jordan’s right not to extend the lease, his government will open negotiations with the kingdom to secure an extension of the lease, which is slated to end in October 2019. Jordan’s Foreign Minister, Ayman Safadi, made clear recently that the kingdom’s commitment to uphold the peace treaty with Israel was not in question despite its decision to end the lease of the lands in Naharayim and Tzofar. 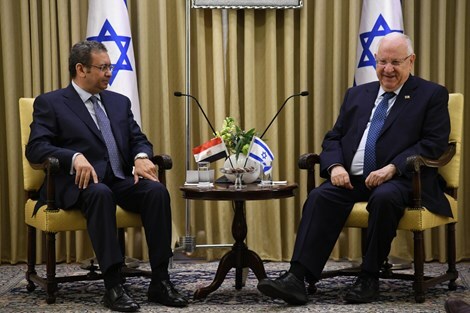 Egypt-Israel ties have been formally cold at times, and Egypt's political elite has remained hostile to any normalization of ties with Israel. Ties appear to have improved under President Abdel Fattah Al-Sisi, who took power in 2013 after the army ousted Islamist President Mohammed Morsi of the Muslim Brotherhood. Earlier this week, Sisi hailed the peace agreement between Egypt and Israel as “stable and permanent”, adding that most Egyptians supported the peace treaty.